The Karen Beasley Sea Turtle Rescue and Rehabilitation Centre has treated three different species, including green turtles. It’s hard out there for a sea turtle. But the Karen Beasley Sea Turtle Rescue and Rehabilitation Center makes it a little easier. The centre, based in Topsail Island, North Carolina, and open for visits April through December, has been dedicated to the care and release of injured turtles since 1995. Over the past 20 years, the centre has grown from a makeshift structure, to a tiny building, to its new home: a 12,400-square-foot facility that, for the first time, has in-house medical resources. The centre has treated close to 500 turtles, including loggerheads, greens, and Kemp’s ridleys—three of the five species found off the North Carolina coast. The centre, which is funded entirely by private donations, is named after executive director Jean Beasley’s daughter, who died at 29. “We saw our first sea turtle nest in 1970 and we both fell in love with them,” says Jean. Volunteers walk Topsail Island’s 42 kilometres of coastline every morning from May through August patrolling for nests; they cordon off and care for approximately 100 nests during the fall hatching season. Beasley estimates that only one in 5,000 hatchlings (baby sea turtles) makes it to adulthood. Not only do the hatchlings have to make a mad dash from the nest to the sea to keep from being plucked off by a bird or fox, life gets no easier once they hit the water. Most injuries that bring turtles to the centre are caused by motorboat propellers, fish hooks, and toxins dumped into the sea, but turtles are also subject to cold-stun, the equivalent of hypothermia for reptiles. Last year’s harsh winter wreaked havoc on turtles, and the centre took in 25 turtles from the Chesapeake Bay area after 1,500 of the creatures were stunned by the frigid waters. Desperate bids to save turtles have led to the centre inventing unconventional remedies. Earlier this year, vets put honey on a turtle’s wounds, and much to everyone’s surprise, the honey did what traditional medicine had been unable to do. Now, the centre is installing beehives on its grounds to manufacture its own honey supply, and a number of other facilities have begun using honey as a salve. The centre’s equivalent of graduation day comes several times a year, when healed turtles are released into the open water. Hundreds of spectators line the beach, forming a human corridor, as volunteers carry the reptiles to the sea. The turtles start flapping their flippers in anticipation as soon as they near the water, but first Beasley has a little word with each one. “I say a blessing to the turtle and ask Mother Ocean to receive them back,” she says. 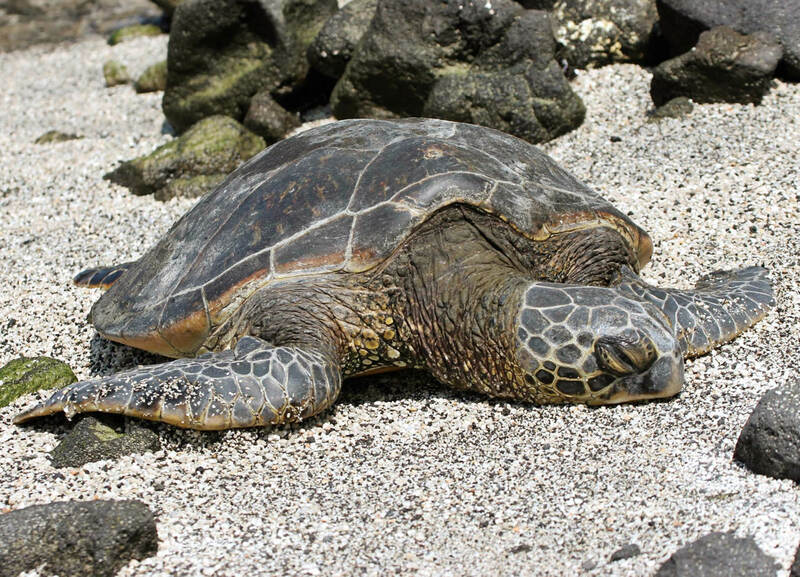 Even the turtles too sick to be released eventually go home: their ashes are put into an environmentally safe concrete reef ball and deposited offshore at Dare’s Reef, named after a turtle who suc-cumbed to its injuries. Beasley plans to have her own remains scattered at Dare’s Reef as well. “My spirit will be swimming with the sea turtles,” she says, sounding well pleased.